Since its inception in 2003, West Shore Aware has raised more than $600,000 to benefit non-profit community groups and student scholarship programs. Another successful fundraising gala, the “White Party with a Sparkle of Yellow Citrine,” on Aug. 20 helped raise an additional $49,000. 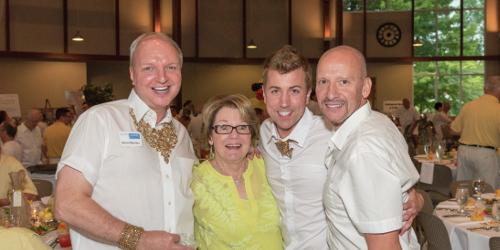 The 13th annual sold-out event brought together the philanthropic organization of gay men, women and their supporters at the Laketown Conference Center in Saugatuck. The WSA board of directors voted in June to award six out of 15 organizations that applied for funding this year. The recipients were the Aware Scholarship Fund, the Chamber Music Festival, the Out Center, Sylvia’s Place, the Wings Home and the Wishbone Pet Rescue. As an agency that relies heavily upon community support and organizations such as WSA to provide vital assistance to those fleeing abusive situations, Sylvia’s Place is “very excited” to receive a portion of the proceeds. “These funds will aid in the 24/7 operation at our shelter and provide basic needs items to survivors entering shelter. Often those fleeing domestic abuse are forced to escape hastily and enter shelter with nothing but the clothing on their backs. Items that most take for granted…a toothbrush, deodorant, shampoo, a gallon of milk, a pair of socks…is out of reach for some in their current situation,” said Executive Director Heather Forrest. Sylvia’s Place provides safe shelter and supportive services to victims of domestic violence and their dependent children. The shelter is capable of housing up to six families simultaneously and is at or near capacity year round. State and federal grant funding allocates approximately 47.9 percent of their annual budget. WSA recognizes that not just humans need assistance. Their generous contribution to the Wishbone Pet Rescue will fund two vital medical needs to serve the impoverished communities in Allegan County and the ever-rising homeless pet overpopulation. President Susan Smith said new surgical instruments and a microscope will replace the used surgical instruments that were donated from another animal shelter when Wishbone established in 2011. This will allow the rescue to safely continue controlling the feral cat population through their Trap-Neuter-Return Program. Any remaining funds will be used to sponsor animals from families in need so their pets can receive vaccinations and other veterinary services in the Fennville and Pullman communities.